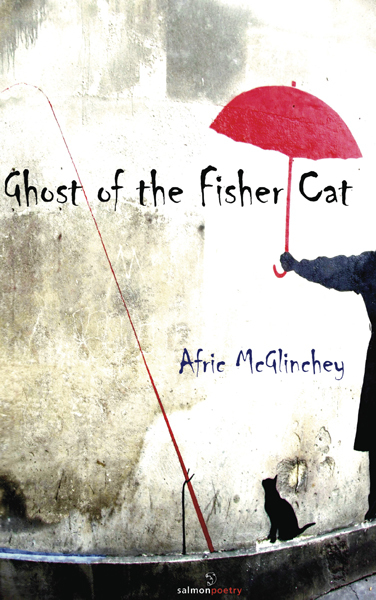 In her newest collection, Ghost of the Fisher Cat, Afric McGlinchey has taken poetry to another level. Here, her poems are sequenced into a novella-like arrangement, grouped into sections where she has allowed characters and relationships to develop “[…] across a time-space continuum […]”. “Vital Impulse” opens with a quote by Matthew Hollis which gives a hint of the poem’s concerns: “I have a cat now. It comes in, it goes out.” The owner analyses and criticises his cat – “It’s just that, in this state, / he’s unreachable,” and calls its existence into question “I could walk / right through him. / All matter is merely / image, after all.” Drawing the conclusion that “The best approach / is an open door”, he completes his line of thoughts. As we receive insight into the owner’s mind, philosophical questions of existence are introduced and the unequal nature of humans and cats demonstrated. The first three sections each contain a poem sharing the section’s name. Consider an example of this – “Slow Dancing in a Burning Room” in the second section; the perception of the surroundings melt, together with the first-person narrator’s imagination, leading to an intended confusion in reading. What is real and what is illusion? Is “the yellowwood floor” really “glowing” – or are those only the “footprints to a future memory”? In the titular “Leavings” in the third section, the speaker again focuses on the surroundings while trying to find a “place to be alone”. The description of “ground sucking and squelching” creates an eerie atmosphere and demonstrates the speaker’s discomfort in that environment. This indisposition is further enhanced when there is “a lone dog sniffling at trees… / no, not alone after all.” The dog being the traditional enemy of the cat, these lines combine with the line, “A strand of hair in my mouth”, and call into question the presumption that the speaker might be a cat. Perhaps the title suggests that this is simply a story about a pet leaving his owner, but perhaps the poet uses that device to deliberately mislead. Although the surroundings here might not seem blurry, the speaker’s identity is. The section “Cold Air Awakening” adds the dead to the cast in this surreal set of poetry. In “Flight MH370”, we are apparently witnessing a catastrophe “as the aeroplane hastens”. As readers, we are overlooking these happenings and the people affected as if a camera-eye was moving us through the cabin: “Under that blanket, a boy / is counting time on his fingers. / A girl sleeps against / her mother’s unmoving / shoulder, while she soars away”. Death is not yet present; however, it might just be a matter of time because only a ”touch will keep him feeling / alive, until the last moment.” The mystery of when death will overcome the passengers lies in the imagination of the reader. Those words also decode the experience of reading this mystical and melodic collection. Thank you Eileen, for your kind review. Re ‘Vital Impulse’, just thought I’d mention that not all the ‘cats’ in the collection are actually cats. This poem refers to a lover! Thank you for your remark and appreciating my work! You are the first author to comment on my work. It is an honour! Ah yes, I thought that there was a personification hidden in this poem. This, of course, changes the perspective. I will add a footnote containing this important info! Your collection is truly inspiring! Thank you!